You’re a socially conscious, progressive-thinking human being. Your friends are all occupying. You’ve transferred your hard-earned dough from a national bank to a local credit union. But now it’s the holiday season, and people expect gifts and holiday cheer. How can you put smiles on the faces of friends and family without also putting money in the pockets of evil corporations? 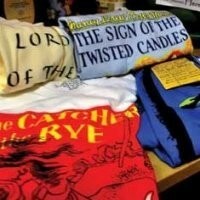 We’ve done some of the legwork for you by highlighting some of our favorite items from locally owned shops. Whether it’s due to the absence of a downtown department store or to the high number of free-thinking artsy residents, it seems there’s a local shop on every city block and tucked in every charming neighborhood. 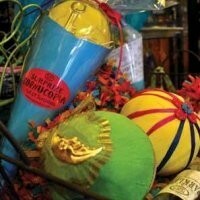 The person behind the counter is often the owner, and each store has its own quirky mix of products. If you want to get a taste of Utah culture, you’ll find it in the local shops—not in Temple Square, and definitely not in a suburban super mall. It’s impossible to feature every locally owned Utah business. For every store we discovered, there are four we might have overlooked. But we hope this guide gives you a taste of the range of gift options Utah businesses have to offer, and a chance to explore new parts of your city while you’re out. 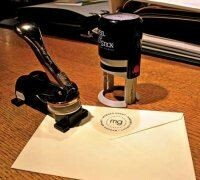 An embosser or stamp customized with the recipient’s initials, name, address or logo makes self-addressing envelopes a breeze and adds a sophisticated touch to books and correspondence. Allow two weeks for delivery after ordering. Runners can be sort of … obsessive. Yours can take the intensity up a notch with a GPS watch. The Soleus 100 tracks speed, distance and calories burned. For total mile-tracking mania, the Garmin Forerunner tracks heart rate, plans routes and keeps track of an insane amount of data—which transfers wirelessly to a computer when in range. So maybe we’re not yet in the age of helpful robot servants, but these little ’bots are always ready to inform you of the time, without you having to ask. 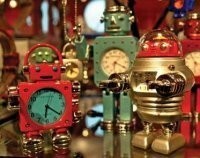 They’re available as keychains, necklaces and standing clocks, so you can build your own time-telling robot army. Don’t let those rad Instagram photos you took on your last road trip languish on your phone. 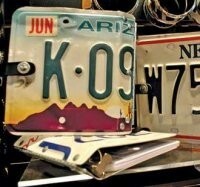 Print ’em out and store them in this recycled-license-plate photo album. The iPad is the ultimate in convenience—the only thing that could make it handier is a keyboard. 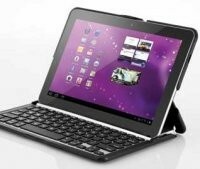 This ideal iPad companion is a protective case, easel stand and keyboard, all in one. Why didn’t someone think of this before? 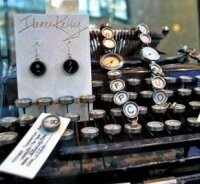 These beautiful accessories, fashioned from the keys of vintage typewriters, make a classy, personal gift. Select a pin or earrings with the letter of his or her name, or a bracelet or watch made with a selection of keys from a typewriter manufactured in a special year. Each includes a tag that denotes the model and year of the keys’ original typewriter. Sometimes, the only way to relieve the soul-crushing monotony of a desk job is to decorate the hell out of the space between the bland cubicle walls. 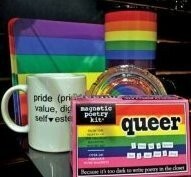 Give someone the gift of self-expression at work with a selection of Pride-themed desk accessories, from mugs and mousepads to ashtrays and magnetic poetry. 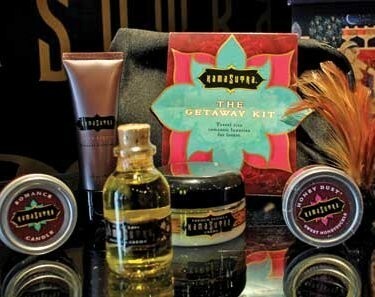 Make sure your next weekend trip is more romantic than comedy with the KamaSutra Getaway Kit, which includes honey dust, lubricant, a candle and other intimate items. They’re all under 3.4 ounces and stow securely in a handy travel bag, so there won’t be any embarrassing scenes at airport security or lubed-up clothing when you open your suitcases. Just make sure to follow through with the trip that the gift implies, or you likely won’t be getting to taste any of the French Vanilla Creme Body Soufflé. Right now, someone you know is plotting revenge against their horrible boss or co-worker. 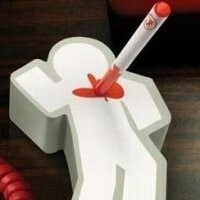 They need a nonviolent outlet for their frustration—or a convenient place to jot down prospective alibis—and this notepad is ideal. 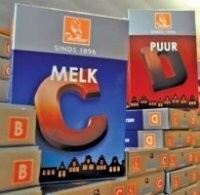 If you can spell, you can make a memorable—not to mention delicious—gift of these milk- or dark-chocolate letters, imported from the Netherlands. They’re perfect for tucking into stockings, but don’t be afraid to go the extra mile: Spell out the entire name of your dearest chocoholic, or communicate your L-O-V-E to someone special. Libraries that smell of fine mahogany are so 2004. Enjoy a leather-bound edition of War & Peace while the air fills with the aroma of blackplum, persimmon and oakmoss—inspired by Leo Tolstoy. 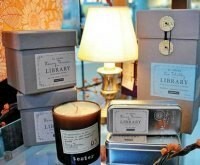 Five other scents are available for authors Poe, Austen, Thoreau and others. 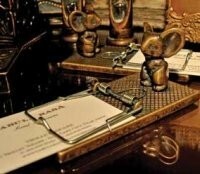 This brass mousetrap paper holder keeps tracks of business cards and important notes and will add a no-mercy air to the desk of an office czar—but don’t worry, it’s perfectly humane. Any runner who’s looking to mix up the routine or correct his or her form will be excited to take these for a break-in stroll this Christmas Day. They might look a little odd, but these shoes allow feet to move the way nature intended—without the pain of being totally barefoot. Wearing FiveFingers while running, hiking, walking or just going about the business of the day improves balance and stability and generates less impact on knees. 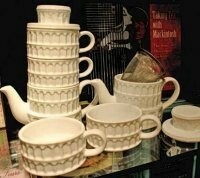 Make sure your elegant, tea-drinking friend doesn’t take himself too seriously with this slightly tilted stacking tea set. 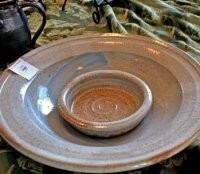 Two ceramic cups, teapot, lid and metal infuser basket are included. 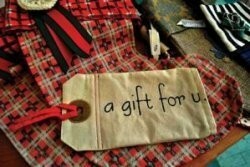 Wrapping an uninspired present in some unusual paper can go a long way toward salvaging your gift-giving reputation. Choose from stylish paper inspired by vintage, science and science-fiction themes, and the recipient might just forgive you for the Tim McGraw cologne. 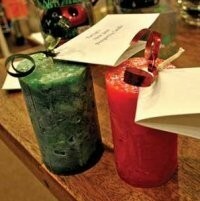 Protect a friend from evil spirits or a bare foyer with a beautiful fairy or witch ball. 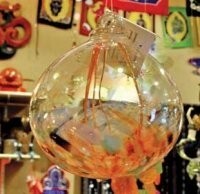 Any evil spirits or bad spells are drawn safely into the center of the glass witch ball; the fairy ball attracts luck and good feelings from passing fairies. You can’t go wrong with either one. While the reindeer-and-glitter-adorned handmade stockings of childhood look charming when hung on Mom and Dad’s fireplace, they look a little out of place in an adult living space. Help someone start a new holiday tradition with these stockings, which retain homespun appeal, but have a fresh, updated look. 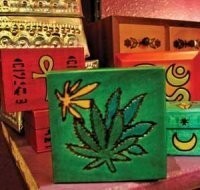 These handcrafted trinket boxes, made from linden wood, feature a multitude of vibrant colored and carved designs that are sure to please everyone on your list. Cat lovers, worshippers of Egyptian mysticism, even admirers of leafy plants will be pleased to use these handy keepsakes. How can that cutting-edge person in your life stand out from the crowd now that everyone has an iPhone? With an iPhone case, of course—the quirkier, the better. Faux wood paneling or a cassette tape is just the thing, especially now that “cassette tape” has been deemed an obsolete word by the Oxford English Dictionary—which you’ve probably never heard of anyway. 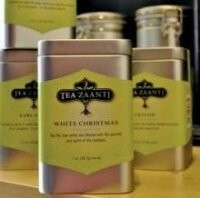 Tea Zaanti carefully selects its loose-leaf teas for their quality, taste and the “purity of the leaf”—meaning they’re often organic or sourced from family-run tea farms. With dozens of flavors, from herbal Raspberry Rose Petal to energizing English Breakfast, these teas will delight a tea aficionado and make converts out of first-time drinkers. Maybe you shouldn’t judge a book by its cover, but who says you can’t judge a person by the books they read? Out of Print’s shirts always make a good impression, and there’s an iconic cover image for everyone on your list—whether they’re into 1984 or Nancy Drew. When lit on New Year’s Eve and left to burn all the way down, the bayberry prosperity candle will bestow “abundance, love and good health” upon whomever lights the flame. If your friend is plenty prosperous but wants to find someone with whom to share the wealth, lighting this soft red candle and repeating an affirmation will lead him or her to the love they desire. What better gift to give your family than the gift of survival? 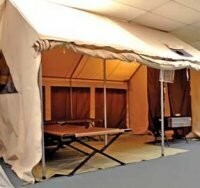 The world is predicted to end in 2012, so get ready now with a fully customizable, deluxe Springbar tent that can be loaded with cots, cookstoves and enough guns and nonperishable food (sold separately) to last you through the apocalypse. These festive gifts will make your holiday parties the hit of the season. Guests unwrap the crepe-paper balls to reveal games, gems, vintage-style toys, magic tricks, organic lollipops, fortune fish and quotes hidden in every layer. Each ball contains five prizes; each cornucopia contains 12. Toiling all day in an overheated office will leave anyone feeling physically and mentally like a snail. And nobody wants to be “that guy”—the one who totes in stand fans and small appliances for his desk. 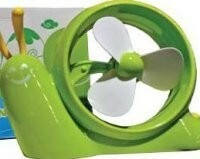 But this simple snail fan is discreet and efficient; it plugs into a computer’s USB port and keeps the air and your mind moving quickly. 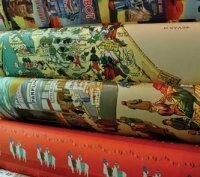 Good things come in small packages—and it’s especially good when that package can be regifted—er, reused. Tucking a gift card or small present into this pouch eliminates the stress of wrapping and taping, and the worry that your carefully selected tissue paper will just end up in a landfill. 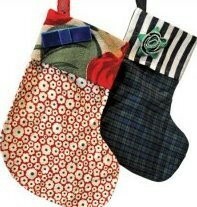 This shiny stocking stuffer will suit the needs of somebody who uses a grinder day after day, year after year. Its laser-cut metal edges will stand the test of time, unlike some cheaper options. Just a hint: It’s not ideal for pepper. There’s no such thing as too many ski days. But corralling all that gear can leave ski bums feeling wiped out by the time they hit the mountain. 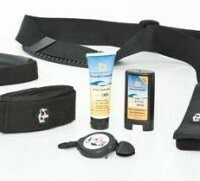 Take some of the juggling out of the equation with this specially priced package from Chums, which includes a ski strap, ski carrier, boot tote, retractable pass holder and two kinds of sunscreen. 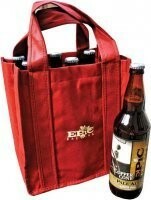 Like Santa with his sack of toys, you’ll be the hit of the family party when you and your handy tote bag show up with a locally brewed high-point beer for each relative. Consumed responsibly, Epic’s many tasty brews will take the tension out of spending the holidays with your nearest and dearest. The perfect melding of nutrition and taste, these delectable bars are made from raw chocolate and contain no sugar, augmented fats, gluten, dairy or soy—meaning they can stuff the stocking of even the most dietary-challenged. If the animal lovers in your life don’t have the square footage to match the size of their hearts, they can still make a difference in the lives of furry critters. 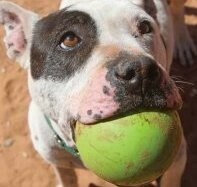 Best Friends Animal Sanctuary in southern Utah is home to many rescued animals who aren’t yet ready to be adopted out, due to health or trust issues. Sponsors can view animals’ photos and story online to find the perfect long-distance pet, from dogs and cats to birds, pigs and horses.